Arrival Leh, our Footprints representative will meet, greet, assist and transfer you to Hotel in Leh. Rest of the day free to acclimatize to the high altitude of Ladakh. In the evening take a walk to the local bazaar in Leh. Overnight at Hotel in Leh. After breakfast at the hotel drive to Alchi / Likir / Uletokpo. 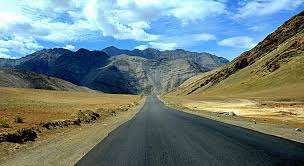 Enroute visit Ladakh Hall of Fame, Gurudwara Shri Patthar Sahib, Magnetic Hill, Confluence of Zanskar and Indus River. Arrive Likir for lunch. In the evening take a walk in the serene and calm Likir village and visit Likir Gompa. Return to Hotel for dinner and overnight stay in uletokpo. After breakfast at the hotel drive to 1000 years old Alchi Dhammchakra Centre. Later drive to Leh, enroute visiting Basgo Fort, Spituk monastery and Kali Mata Temple. Evening free to stroll around Leh market. Dinner and overnight at the hotel in Leh. Early morning proceed to Nubra Valley via the World Highest Motorable road (5602 Mts) Khardungla pass. Arrive Nubra and proceed for a visit to the White Sand Dunes at Hunder. You can enjoy the camel ride (On Own). Later if time permits visit Hunder Sand Dunes and Diskit monastery and check in at Deluxe Camp. Evening at leisure. Overnight at the camp. After breakfast drive back to Leh taking the same route. On the way back if time permits you can stop for a visit at Thiksey monastery and Shey Palace. Arrive Leh and relax at the hotel or free for individual activities. ♦ PAYMENT POLICY: To book the tour, you have to deposit 15% to 20% of the total tour cost per person as a token advance, 50% of the tour cost has to be deposited 30 days before commencing the tour. Rest of the 50% will be collected on arrival.